Crunchy raw celery sticks make a nutritious snack to help manage your weight. You'll get essential vitamins and minerals from celery needed to maintain your overall health and keep your immune system at its best. Try dipping celery sticks in a small amount of low-fat salad dressing, hummus or peanut butter for a little extra flavor. Or add celery to soups, stews and casseroles to increase the volume and nutrient content. Celery is a low-calorie and fat-free food perfect for helping you lose or maintain your weight. It's made up of 95 percent water by weight. All this fluid helps you feel full and satisfied without contributing many calories. 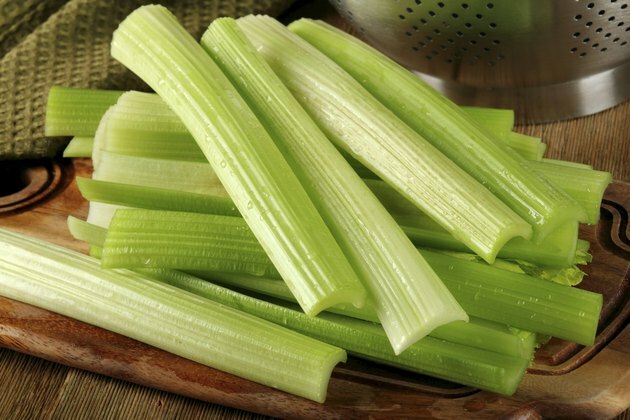 From 2 medium stalks of celery about 8 inches long you'll get only 12 calories and 0.2 grams of fat. There is also less than 1 gram of protein per serving of celery. Celery is a low-carbohydrate food, which fits well into a meal plan for diabetes or low-carb diets. Eating celery won't impact your blood sugar much because it only contains 3 total carbohydrates per serving. About 1.5 grams of this carbohydrate is dietary fiber, which is indigestible but essential to your health. Fiber absorbs water and swells in your digestive tract to provide bulk and keep foods moving through your body. Eating an adequate amount of dietary fiber may help regulate digestion, maintain your weight, lower cholesterol and even prevent certain forms of cancer, according to Colorado State University Extension. Eating celery as part of a balanced diet helps you meet your daily need for vitamin K. A serving of celery provides 23 micrograms of vitamin K, which is 29 percent of the daily value. Adequate intake of vitamin K helps ensure your blood clots properly. According to MedlinePlus, vitamin K may also play a role in maintaining bone density as you age. You'll get 8 percent of the daily value for vitamin A and the B vitamin folate as well. These nutrients are essential for cell formation and for maintaining your eye, skin and bone health; they may also prevent certain birth defects. You'll also get some essential minerals from eating celery. A serving of celery provides 6.5 percent of the daily value for potassium and 3 percent of the daily value for calcium. Both calcium and potassium function as electrolytes, which maintain electrical impulses in your body and help to regulate fluid balance. Meeting your daily needs for potassium also helps keep your heart healthy and maintains proper blood pressure. Calcium plays a part in forming strong bones and teeth and also in hormone regulation.